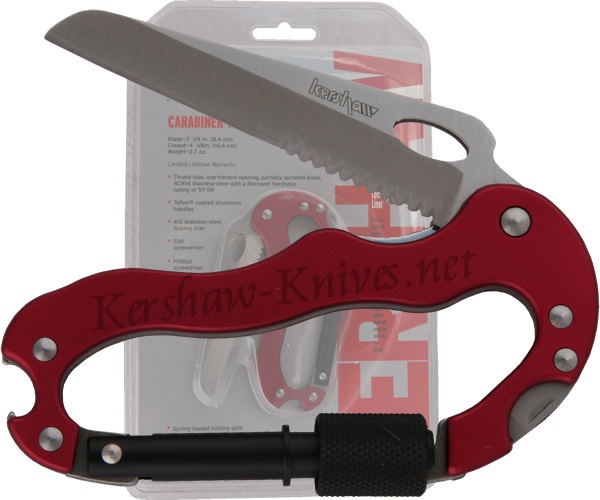 The Kershaw Carabiner Tool attaches to just about anything you want to attach it to. The knife blade is partially serrated and made of AUS6A stainless steel. When the knife blade is open the body of the carabiner serves as a knife handle, and a comfortable one! To add even more functionality the carabiner tool includes a bottle opener, a flat head screwdriver, and a phillips screwdriver. This Kershaw 1004RDX model has a red teflon coated body.